Many people don't realize exactly how exciting and friendly New Orleans can be for families with kids, even for that especially tough-to-please toddler age group. A family with a toddler in tow can easily fill a week with unique, entertaining activities with no trouble at all, such as the ones featured below. Toddlers will love the wide array of marine life on display at this world-renowned aquarium. The scary beasts, like the sharks and the white alligator, provoke quiet awe, and the playful sea otters and penguins get the little ones laughing every time. The most enthralling part of the aquarium for my own toddler, though, is always the underwater tunnel, where he can stare, enthralled, for enormous stretches of time. There's an IMAX theater in the complex as well, though many toddlers might not be able to sit through the whole film -- it depends entirely on the kid, of course. The Audubon Zoo, truly one of the world's finest, offers its resident animals large and beautifully-designed habitats and offers beautifully landscaped grounds for its visitors, too. Small children love the animals, of course, but they also love the small water park contained within, called the Cool Zoo, which does have a designated area for the toddler-to-preschool crowd. The third major piece of the Audubon puzzle sounds super-icky to lots of parents, but it's actually quite fascinating. Okay, yes, there are some big gnarly spiders and some chihuahua-sized cockroaches, but you don't have to touch them and the beautiful butterfly garden makes up for them, and the underground exhibit that "shrinks" you to the size of the bug is a favorite for kids. The Insectarium is perhaps not quite engaging enough for the youngest set of toddlers (try the zoo instead; bigger animals are easier to see and identify), but is plenty entertaining for the 2-and-up group. Please note that if you want to attend all three Audubon attractions plus an IMAX show, there's a discounted package deal called the Audubon Experience Package. This interactive play-based museum is likely not entirely different from whichever children's museums are local to you, particularly in the realm of toddler-friendly activities, but it's still a fun (and air-conditioned) way to spend an afternoon, and even if it seems similar to your adult eyes, your child will love exploring the new-to-her space. Exhibits include a miniature play cafe, a tugboat that can be "captained," a tiny Winn-Dixie grocery store, and a "First Adventures" exhibit, specifically geared toward the 0 to 3-year-old set. Special Toddler Time activities are held on Tuesdays and Thursdays at 10:30 am (double-check the LCM website, as this is subject to change). Note that the Louisiana Children's Museum is a member of the Association of Children's Museums and accepts reciprocal membership benefits from other museums across the country. If you're a member of your local children's museum, you might be entitled to free entry; you can call ahead to double-check. It's a little one-car train that rides right through town -- what's not fun about the streetcar? And for the price, you can't beat it. It's a nice relaxing ride with a great view for the parents, with all the thrill of a train ride for the little one. This whimsical little playground tucked away in the expansive and gorgeous City Park is built by the same folks at Blaine Kern's Mardi Gras World, who build many of the greatest New Orleans Mardi Gras floats. Instead of your standard swings and slides, you'll discover enormous, play-able statues of beloved storybook characters. Climb into the mouth of Pinocchio's Whale! Catch a puppet show at Cinderella's Castle! Slide down the fiery breath of an enormous dragon! It's a whimsical, wonderful little play space. Adjacent to Storyland in City Park is the small and very sweet old-school Carousel Gardens Amusement Park, home to the famous "Flying Horses," an antique carousel beloved by many generations of New Orleanians. It may be too "grown-up" of a park for some toddlers, as you need to be 36" to ride the rides alone, but kids can ride the carousel and the little train with their parents, and kids on the older or taller end of the toddler spectrum can ride some other kiddie rides as well. The Besthoff Sculpture Garden is a free exhibit of fine sculptural art located adjacent to the New Orleans Museum of Art in City Park. True, most toddlers can't appreciate fine sculptural art, but they can appreciate green spaces where they're allowed to run free while their parents enjoy the pieces on permanent display. This is a good way for you to drink in some culture while the toddler gets his wiggles out. Some of the more literal sculptures might catch their eye, even -- they might enjoy darting under the giant spider, for example -- but really, it's just an easy place for an early walker (or runner) to get some practice while their parents enjoy themselves, too. Do note that some sections of the garden involve waterscaping and ponds, so it's probably best to steer clear of those (or use extreme caution) in order to avoid an unintentional swim. Kids love boats, and a spin on the free Canal Street Ferry is the best deal in town, where boats are concerned. There are actually two ferries -- a roundtrip to Algiers (a very short ride; about 5-10 minutes each way) and a roundtrip to Gretna (about an hour long roundtrip). The 5-minute trip is a bit closer to the attention span of most of the toddlers I know, and the Algiers neighborhood is actually quite sweet, if you'd like to take a little walk on the far side of the river, or you can linger at the ferry station and take the next one back immediately. Catch the ferry right at the foot of Canal Street, next to the Aquarium. 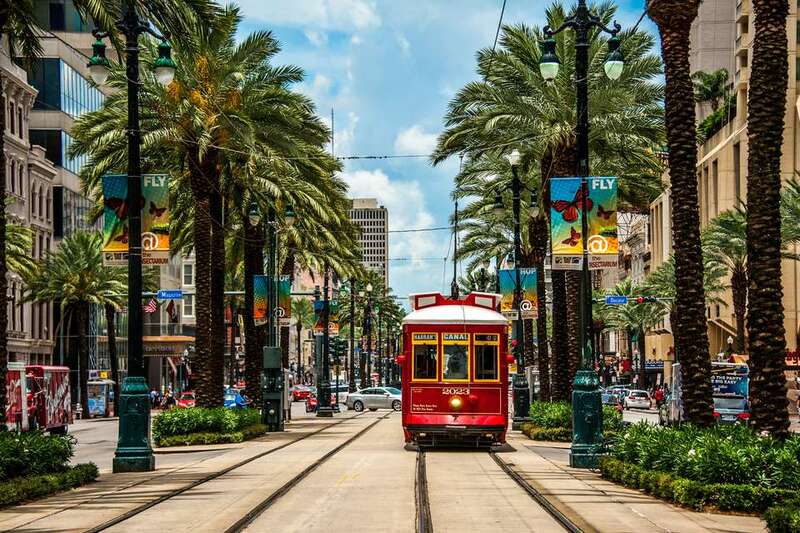 Though many generally wouldn't spend a ton of time on Bourbon Street with their kid, the French Quarter is certainly not a wash, and the vibrant street-arts scene that takes place around the Jackson Square offers a feast for little eyes and ears. Pick up a sack of beignets at the Cafe du Monde and then find a bench and watch the busking musicians, the mimes, the painters, the horses with their carriages waiting to pull around a new set of tourists, and all the other slow-paced hustle and bustle.